When standing on the platform of one of London’s busiest tube stations, many people are unaware of what is happening above their heads, beyond the concrete amidst the hustle and bustle of the modern day city. OCMIS designed and installed an automatic irrigation system, with inclusive PH level monitoring and fertiliser input amongst a number of other features. to the inner city park area being developed above the Jubilee line station in Canary Wharf. 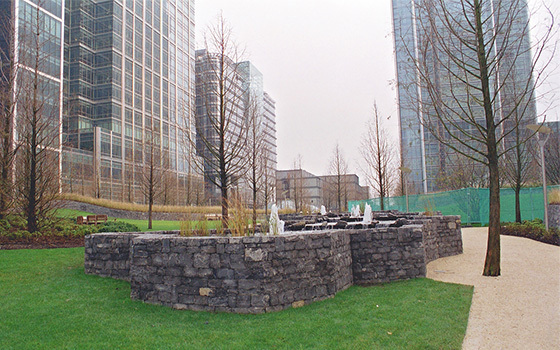 The enormous variety of plants are all irrigated using a variety of spray, mist and drip watering techniques, all centrally controlled by a PC based system located within the Canary Wharf Management building. 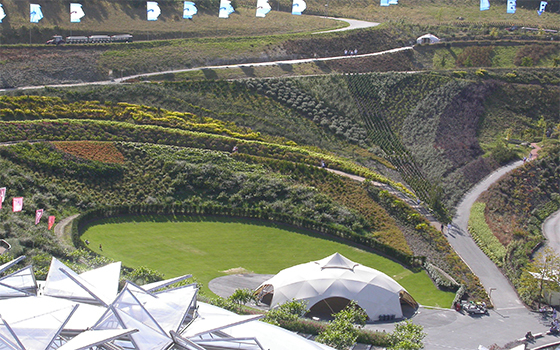 Such an iconic and individual site required a high tech and advanced irrigation system. Each part of the system can be individually controlled to very precise measurements enabling such a complex environment to be carefully monitored. The three world areas – tropics, warm temperature and outside spaces – are each accounted for and the highly advanced system results in minimal waste. 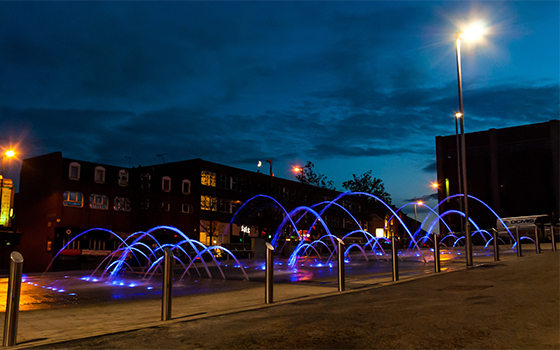 Located at the heart of Barnsley in South Yorkshire, OCMIS have installed a new water feature commissioned by Barnsley Metropolitan Borough Council and designed in collaboration with in-house Highways and Engineering Department. Situated next the town hall, and as part of the £1.9 million Experience Barnsley Museum and Cultural Project, the dancing jets are a permanent addition to the town that have already been enjoyed by thousands of residents and tourists. The feature consists of 30 custom made nozzles in three banks of 10. The nozzles are integrated into channels with stainless steel grilles to provide an uninterrupted pedestrian area. 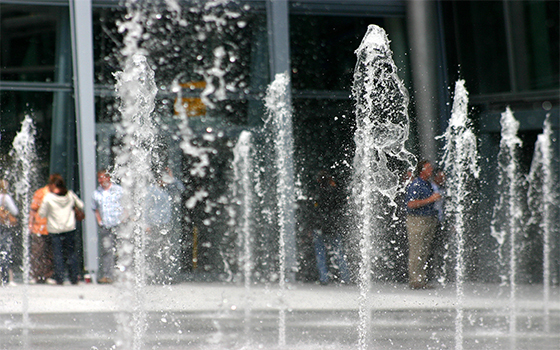 The arching jets of water provide a sense of drama when viewed from street level. The jets are controlled by a bespoke control panel, designed and built by OCMIS, which contains a menu of programmes that can be selected from the touch screen. Each programme is designed specifically for the Experience Barnsley scheme, making this a unique feature that cannot be experienced anywhere else. The water is housed in a 50,000 litre underground water storage tank and pumped at 30,000 litres per hour, passing through a filtration and a chlorine dosing system to combat water based bacteria, creating a safe and fun environment for visitors of all ages to enjoy. The central control panel can be accessed remotely using a secure internet based remote access system. This allows OCMIS engineers to fault find and make changes to the displays and light shows quickly. It also gives the BMBC operators the ability to control the system remotely. 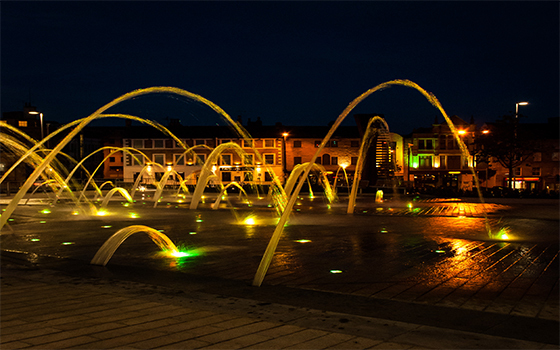 As twilight falls the feature comes to life, 90 RGBW LED lights throw beams of light through the water jets creating a spectacle on a grand scale. The naturally fading LED’s intertwine and synchronise with the display, creating enchanting coloured streams of water. With the possibility of choosing 16 million colours, there is never the risk of the feature becoming mundane. With the feature being a place of fun and entertainment during the day, by night it turns into a beautiful centre piece at the heart of a town. OCMIS worked closely with Hyland Edgar Driver to develop a water feature to suit the scale of the new Heathrow Terminal 5. The 39 meter high glass façade conveys power and modernity. Positioned in between the terminal and car park, the Interchange Plaza is an intimate space with mature trees and planting that allows visitors to spend time relaxing. Positioned adjacent to the main pedestrian routes between the car park and the terminal the dry plaza fountain provides animation, light and sound. The 55 Choreoswitch™ waterswitches are linked to 11 pumps located in a purpose built basement plant room beneath the Plaza. The combination of individual nozzle switching and control of the pumps enables OCMIS to programme displays to suit any occasion. The switches are linked to a DMX unit that also controls the 110 colour changing LED lights integrated into the nozzle housings. Displays can be fast and energetic with dramatic colours or subdued and gentle. 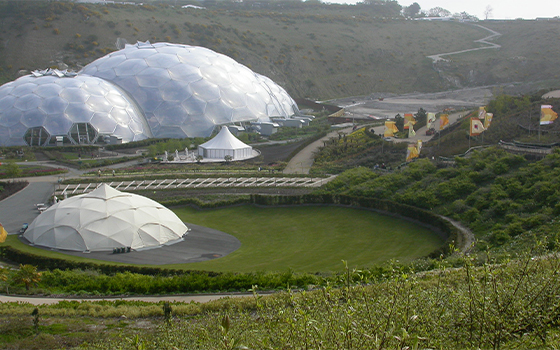 The scheme took three years to develop from the design concept to the start of construction. OCMIS were contracted to Laing O’Rourke and worked closely with them to deliver the project safely, on programme and on budget. Building standards at Heathrow Terminal 5 were exacting and it was an exciting challenge for the OCMIS design team and engineers to work to the rigorous standards. 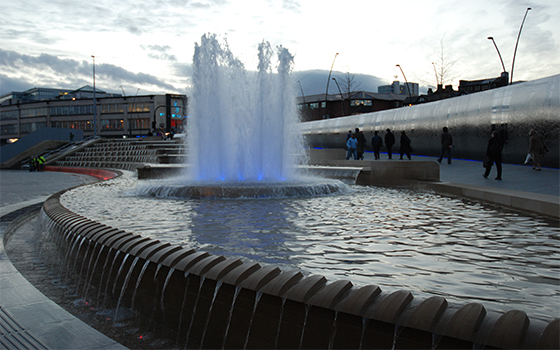 Sheaf Square, located on the subterranean confluence of the river Sheaf and the Porter Brook, has been redeveloped into a new public space outside Sheffield Railway Station and stands as the new gateway into Sheffield. 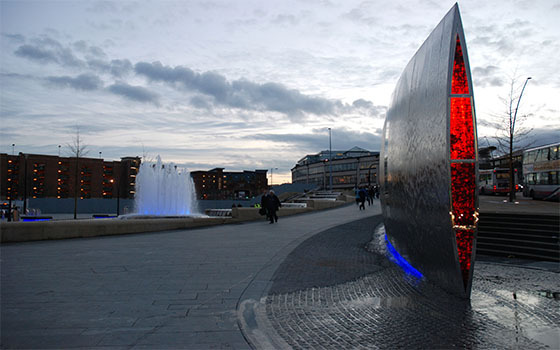 Forming part of the ‘Gold Route’, extending from the station into the heart of the city, the redevelopment of Sheffield Station and Sheaf Square has provided Sheffield with a world class entrance into the city. 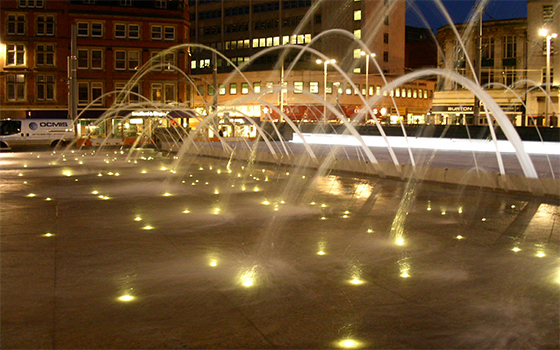 As part of this redevelopment, OCMIS working with Sheffield Regeneration Projects Design Team (RPDT) and Jordan’s Engineering, have developed the initial designs into a world class water feature. Essentially comprising of two separate elements the fountains consist of a cascade feature with seven cascading pools of water, adjacent to the 80m long stainless steel water covered ‘Cutting Edge’ sculpture. Concealed along the foot of the lowest cascade a custom designed and manufactured ‘cold mist’ system produces clouds of virtual steam at pre-set intervals during the evening. During the design phase of this project OCMIS constructed various full size mock-ups, developing and approving the concepts as work progressed ensuring the final result exceeded expectations. In a high profile feature such as this a large quantity of plant is required in order to both operate the various systems and maintain the water clarity and safety, concealing all this equipment whilst maintaining accessibility can be problematic. 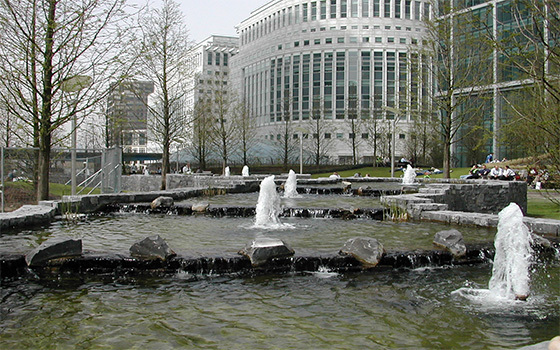 At Sheaf Square the entire fountain mechanics are concealed in plantrooms located below the cascade pools, allowing operators straightforward efficient access to all items of equipment. Additionally, being in Sheffield, OCMIS utilised stainless steel pipework throughout the plantrooms, all fabricated within our own fabrication department, and assembled on site. Water quality is crucial for all water features such as this, and as such the water is constantly filtered, treated and monitored with an automatic system in the plant room, utilizing chlorination, UV and Ozone sterilisation systems to ensure it is clean and safe. The entire system is operated by a user friendly touch screen operator interface and controlled by an OCMIS design and built control panel. 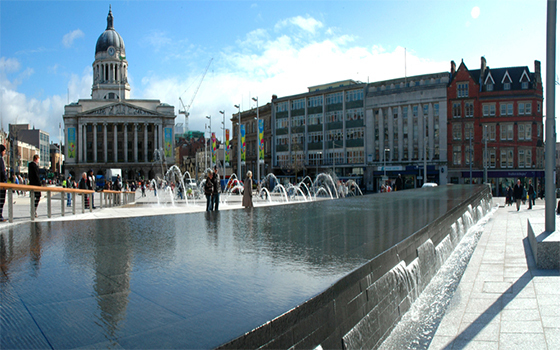 The history and popularity of Old Market Square in the hearts of the people of Nottingham needed a very special, versatile and inclusive design. Since completion in 2007 the Gustafson Porter designed scheme has proved its worth, a thriving centre to the City and a home to civic events, fairs, concerts, markets and the summer Beach Party. 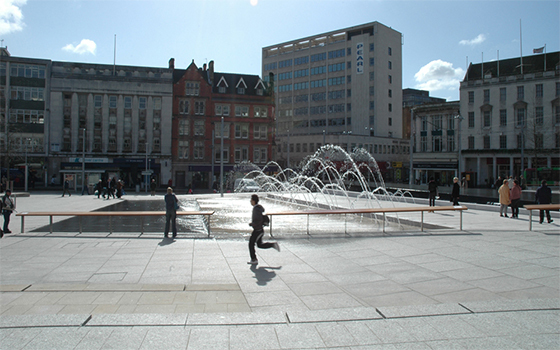 The scheme was commissioned by Nottingham City Council and OCMIS implemented the water features with Balfour Beatty Ltd as the main contractor. 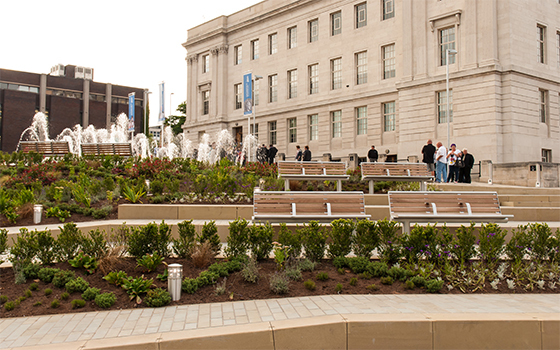 The water features at the western end of the square are huge, complex and enormously popular. There are three main elements, a 30 metre long reflective water table, a jet terrace with arching jets that are fun to all age groups and also a reflective and interactive water scrim. The sky and surrounding buildings are reflected in the water table and scrim, enlivening the space and adding to the appreciation of the surroundings. The water table at the southern end of the water fall is cleverly animated by the dynamic water effects on the sides as the water flows over the edges into the rills. The design of the water fall at the southern end creates strings of water that break up and catch the light, enhancing the effect using a minimum water flow. 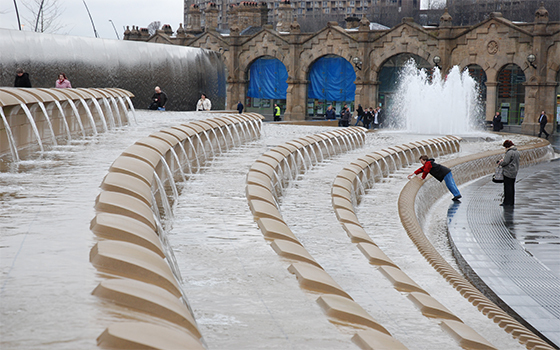 The different widths and ranges of the bespoke arching jets give height and a random feel to the central terrace, allowing people to interact and walk close to the jets without having to get wet. The adjacent scrim has a few millimetres of water flowing over it, again to allow children and adults to walk over it and interact with the water without getting wet. At night the feature is subtly lit with lighting under the water fall and in the two rills. 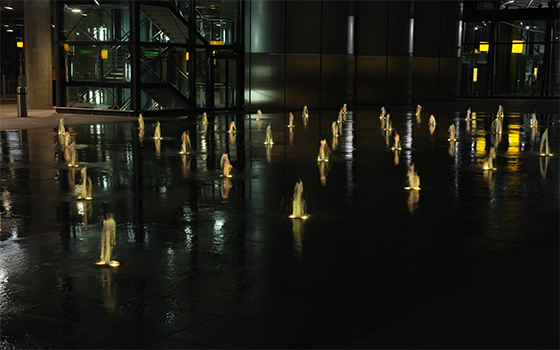 The fibre optic lights in the jet terrace highlight the movement and form of the arches of water and draw people towards it. The light from the surrounding buildings and street lighting reflects in the wet surfaces, making a magnificent spectacle of the Town Hall when viewed across the feature from the western end of the square. The mechanics of the system are installed underground in the old public toilets. The water recirculates so minimal additional water is needed. A large below ground tank allows the features to drain down when not in use without wasting the water. There is an automatic filtration and treatment system that ensures the water is safe, and the display pumps are controlled through a bespoke control centre to allow features to be operated to suit the activities in the Square. 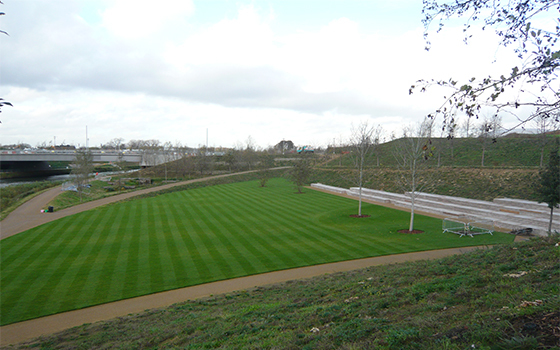 OCMIS installed the irrigation systems to the Olympic North Park and Eton Manor as part of the major construction works in the run up to the games. The project was so large and complex that several landscape contractors were working on the site simultaneously to ensure the deadline was met. OCMIS were given the responsibility of installing the irrigation system across all three of the North Park work zones, working with different contractors in each area and ensuring the soft landscape had water available as soon as it was planted. 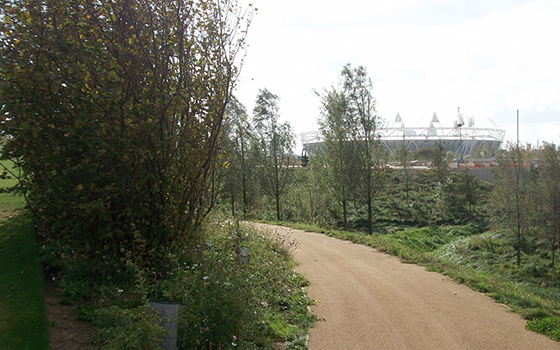 The North Park is divided by the River Lea running north to south; the A12 running east to west separates the Eton Manor site from the main park. The site wide non-potable water main is operated by Thames Water and supplies high quality treated water from the nearby sewage treatment plant. This system supplies water for irrigation, toilet flushing and other non-potable applications in the surrounding buildings. OCMIS fitted separate automatic pump stations to each of the three areas to provide enough flow and pressure for the irrigation system. The pumps automatically regulate the flow into the irrigation main depending on demand. 29,000 metres of underground pipe work was installed as the construction works progressed. The pipe work was laid as the complex landforms were constructed, with the control cables installed alongside the pipe. The works were carefully sequenced with the installation of other services, construction haul roads, bridge, road, path installations and many other factors, all to a critical programme. The irrigation controllers allow the maintenance teams to easily adjust the amounts and frequency of irrigation. The systems were programmed with run time data based on the application rates for each area; adjustment of this ensures quick and accurate scheduling to minimise water use. The shrubs, trees, lawns and meadows all have different water requirements depending on the aspect and location. OCMIS installed the systems with our own directly employed installation teams to ensure quality and continuity throughout the park. With 1100 sprinklers, 52,000 metres of drip pipe and 1200 trees to irrigate, benchmarking, good working practices, communication and work scheduling were key to delivering the schemes on time. 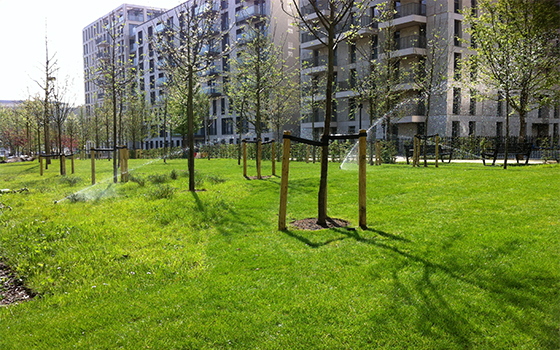 OCMIS installed the irrigation system for the Athletes Village public realm during the construction of the village. It was a complex series of contracts working with a number of separate contractors to install one unified irrigation system. 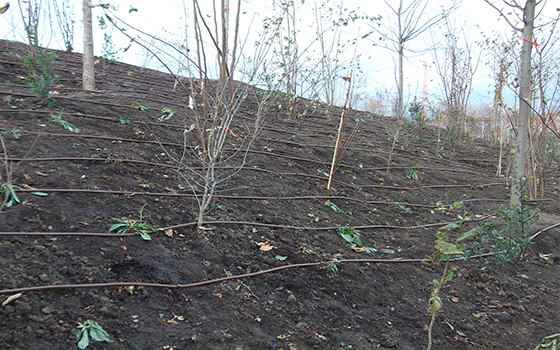 The irrigation system was spread through the whole site, and OCMIS worked with seven construction and landscape contractors to deliver eleven separate contracts across the public realm. The infrastructure for the system crossed over all the work areas, with mainline pipe and cable being laid along the streets and terminated in the soft landscape areas. This phase of the installation was part of a site wide Earthworks package, installed as the levels were finalised and before each area was handed over to the finishing contractor. OCMIS then connected to the mainline as part of the follow-on contracts and continued the system into the finished landscape as part of the soft landscape works. Water for the irrigation system was harvested from site run off and treated through the ponds, reed beds and an aeration system in the wetlands. Once treated, the water is used for irrigation, toilet flushing and to circulate through the feature ponds in the village landscape. 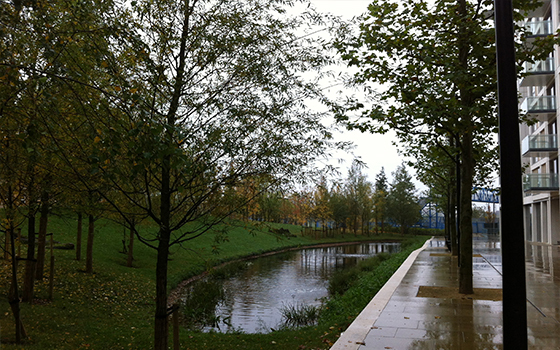 As well as the irrigation, OCMIS also installed the Wetlands aeration system, the pond re-circulation system and the grey water supply to Chobham Academy as part of the works. The shrubs and trees are irrigated using pressure compensated drip to ensure uniform application rates and avoid water loss. Lawn areas are irrigated with 310 sprinklers and spray heads, there is 20,000 metres of drip pipe and the whole system is controlled through 141 solenoid valves across the site. 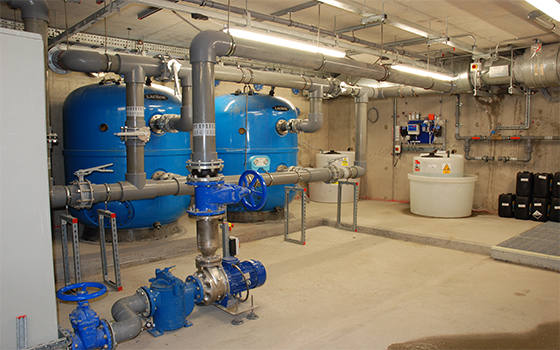 The site wide system is supplied through pumps and filters in the wetlands plant room and a central irrigation control system. The irrigation in each of the landscaped areas is connected to the controls through a wire path laid with the mainline pipe. 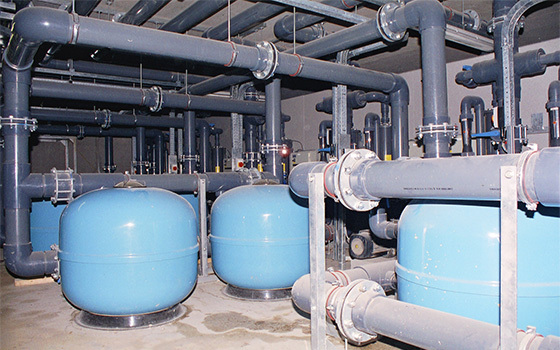 The distribution of water around the village is controlled by the maintenance team from the plant room, where they can adjust application rates to suit the different areas. The technical challenges together with the logistics and tight programme meant this was a demanding project. 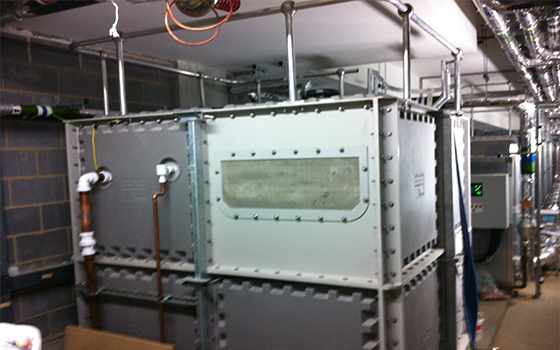 Good site communication and experienced OCMIS installation staff ensured the system was installed on time and on budget.